Snow shovels are designed for different tasks, such as scooping or pushing snow, or dealing with heavy snow loads. All snow shovels are not created equally. Much like screwdrivers, saws and dirt-moving shovels, snow shovels are designed with different conditions and functions in mind. Some excel at pushing lightweight snow, while others are ideal for scooping heavy snow out of the way. 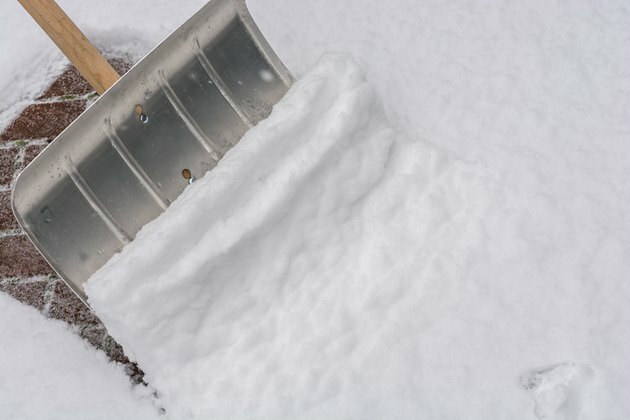 If your region gets a lot of snow every year, it's worth your time to invest in more than one type of snow shovel to save your time... and your back. 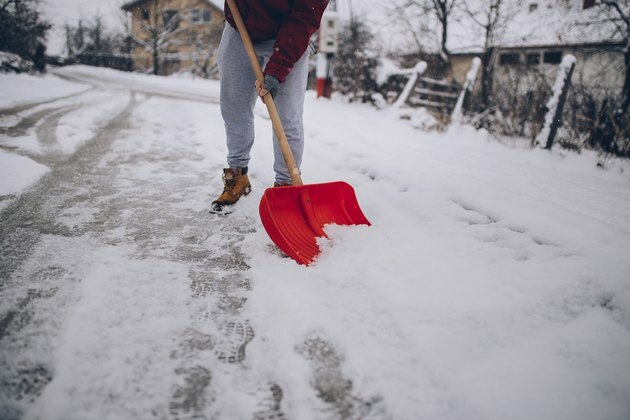 Shoveling the driveway during one snowfall may feel completely different than your next shoveling experience, even if there's a similar amount of snow. The amount of moisture within the snow is what makes all the difference. A cubic foot of water weighs about 62 pounds; snow typically contains anywhere from 5 to 32 percent water, which means one snowfall may weigh a lot more than another. A cubic-foot or huge scoop of fluffy snow may weigh as little as six pounds, while a typical Midwestern snowfall, with approximately 20 percent water content, weighs closer to 13 pounds. Wet, completely saturated snow weighs nearly 20 pounds, which amounts to a lot of backache-inducing work, even on a relatively small driveway. The right shovel for the job can help minimize the effort and strain it takes to clear walkways and driveways. A quality all-purpose shovel is good for both scooping and pushing snow. 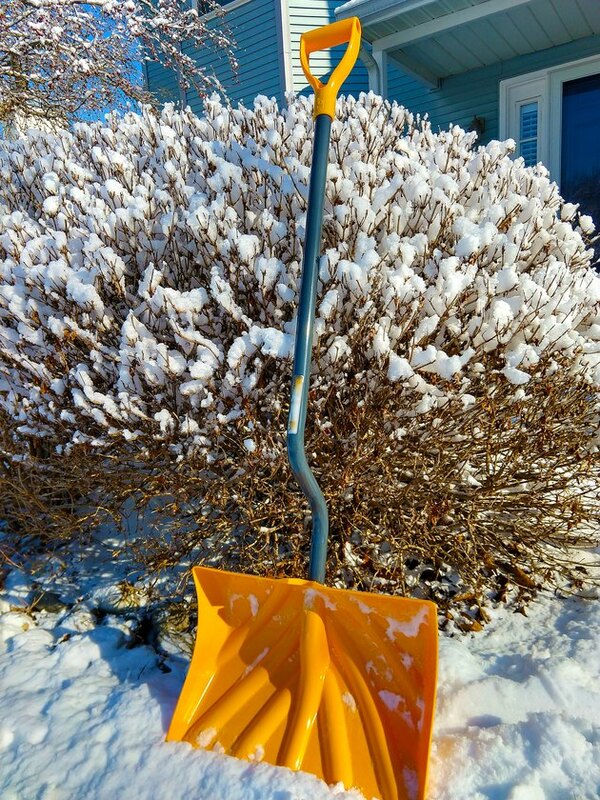 Whether you live in a climate that gets one or two shovelable snowfalls per season, or one or two per week, it's good to have a lightweight, well-designed shovel to serve as your go-to piece of snow-removing gear. A good general-purpose snow shovel is light enough that it won't cause fatigue when moving fluffy or even slightly wet snow. Look for a shovel with an 18-inch wide blade that has a slight vertical curve to the bowl. This helps move a lot of snow, whether scooping or pushing. While wider shovels exist, they're best for lightweight snow. A thin metal strip on the edge of the blade is a must if the shovel blade is plastic or a composite material; this helps prevent wear that would otherwise shave down the blade over time. If shoveling off a wooden deck, however, stick with plastic, as the metal could damage protruding deck wood. The handle should also be durable and lightweight, whether made of metal, fiberglass, wood or plastic. The grip on the handle must be wide enough to fit your gloved hand; it also shouldn't wiggle on the handle. Try the grip on for size in a store while wearing your shoveling gloves. While you're at it, test a few similar shovels out, aiming for one that's both light and durable and that feels right for your height. This will serve as your most-used shovel, so comfort and durability are key. A bargain-store shovel may do the trick if you only need to shovel snow once every few years, but if you shovel often, go for quality. Cheap shovels tend to crack, break or otherwise come apart. Snow shovel with ergonomic design. If you shovel often or have a large driveway or walkway, opt for an ergonomic shovel designed to help reduce potential pain and strain on your back. This type of shovel has an angled handle, designed to align the blade with the ground so you don't have to bend over as much while scooping. As with a general-purpose shovel, try this style out in the store first, as some feel a bit unwieldy at best. This type may also be difficult for children or those of less than average height to manage, since the handle is designed to be used at a specific angle to the ground. A snow pusher, as the name implies, helps push snow out of the way, quickly. These have wide blades that aren't as tall as the typical all-purpose snow shovel. The blade is also highly curved, keeping snow from piling into the blade area. These are best for snow that's a few inches deep or less, as the blade doesn't work well for scooping snow to place it atop a pile on the side of the driveway. If snow is light and fluffy, this is a great tool that won't strain the back, since there's little lifting involved. The best snow pushers feature aluminum or polyethylene blades, which can also be used to break ice by smacking it with the back of the blade. Snow pusher blade widths range from 24 to a whopping 48 inches, able to clear even wide driveways in a hurry. Some versions also have wheels on the back, but these may prove a bit awkward as it's harder to angle the shovel for maximum leverage. A snow-scooping shovel helps remove deep piles of heavy snow. 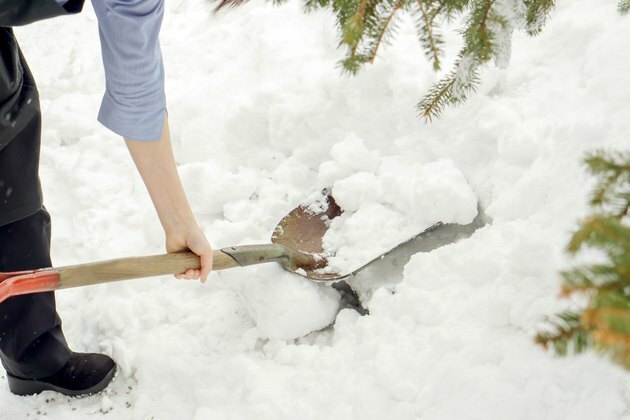 If the snow is really heavy and wet, or even moderately heavy but deep, a shovel that excels at scooping is a must. The blade portion of this shovel looks more like a grain or coal shovel, featuring a straight edge and sides designed to hold a hefty scoop of snow. Look for a lightweight model with a metal or polypropylene head. A metal edge helps break hardened, icy snow, such as deposits left at the end of the driveway by a snow plow. This type of snow is great for scooping massive drifts down to size, or for moving that snow-plow deposit so you can get the car out of the driveway. A metal blade helps break thin layers of ice beneath the snow. 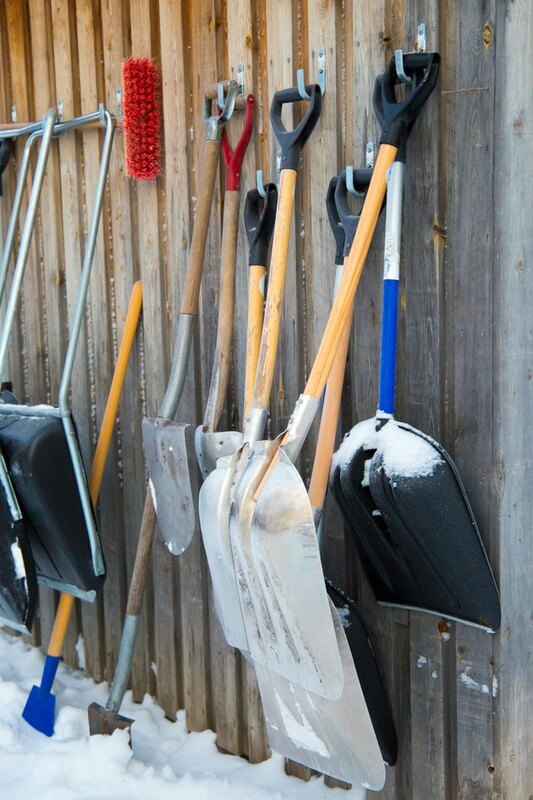 A lightweight shovel with an all-metal blade, typically aluminum, is a great tool to add to your winter-weather arsenal. It's also a good all-purpose shovel when the snow isn't extremely deep or heavy. Why it's good: This shovel is strong enough to break through minor icy chunks, or to break wet, heavy drifts down to size in a hurry. These shovels don't weigh much either, so there's not much strain when lifting or hurling snow. The downside: Snow tends to slide off of the slick metal blade, since the blade is shallow and nearly straight.